So, if you remember, late last year (see here) we had brought you word of a company from out west called TogetherMade that was creating some rather ingenious kits to get you and your little ones creating things together. You know, the sort of items that you might make when you were away at summer camp. Well, today is the first part of our review of some of the items that TogetherMade has on offer. Now, why is this the “first part”? Well, that’s just due to life and scheduling. We’ve got one more kit in the mix, but we’ve just not had time to sit down and get that together. So, for now, we’ll cover what we’ve made, and hopefully have the last piece of the puzzle done and up for you soon. In the meantime, we’ve got three different items we’ve made. First up from TogetherMade are these fun little bowsaws ($5). They’ve just got 5 pieces (two handles, two pegs, and then the bowsaw) but it’s a quick project easier for younger hands to start popping together. This was a nice warmup, and then we got to play with the dye that was included as well. The next items we made were the TogetherMade Camp Bracelet kit ($15). This really has that summer camp / Tandy Leather vibe to it. You’ve got a precut piece of leather (in two different finishes), and then some leather rawhide strands to start stitching through and coming up with your own pattern. Once I assembled the button studs onto the end, I showed my girls how to start their patterns, and set them loose. You’ll notice in some of the photos of the TogetherMade Camp Bracelet process that I’ve got a small cutting board there. This is because, rather than a needle, you use a simple nail to push the rawhide through the holes in the bracelet leather. It’s a quick way to do it, but I wanted to protect the dining room table. The girls had some planning and thinking to do about what they wanted the pattern to be, but they set to it. There was some help here and there, particularly near the end, but they, by and large, built these themselves. And, at the end, they had some fun little bracelets that were all theirs. Once those were done, my oldest (and I) got to learn about saddle stitching. This is because that’s how you put together the TogetherMade Lumberjack Wallet ($30). At first, having a piece of waxed thread with a needle on both ends feels weird, but then as you start following the instructions, it makes sense, and it mades for a very sturdily-stitched wallet. For this one, we had another cutting board in play, just to help with pushing the needles through the leather. I suppose a thimble could help here as well. There was some assistance I had in the very beginning, showing my oldest how to do the saddle stitch, but then she was off to the races. There were a few spots I helped out on, and again at the end, but she stuck with it and put it all together, though she did say her fingers were a bit sore at the end. Once the stitching was done, it was a matter of melting the ends of the thread to lock things in place, and then burnishing the edges of the wallet to give it a more finished look. 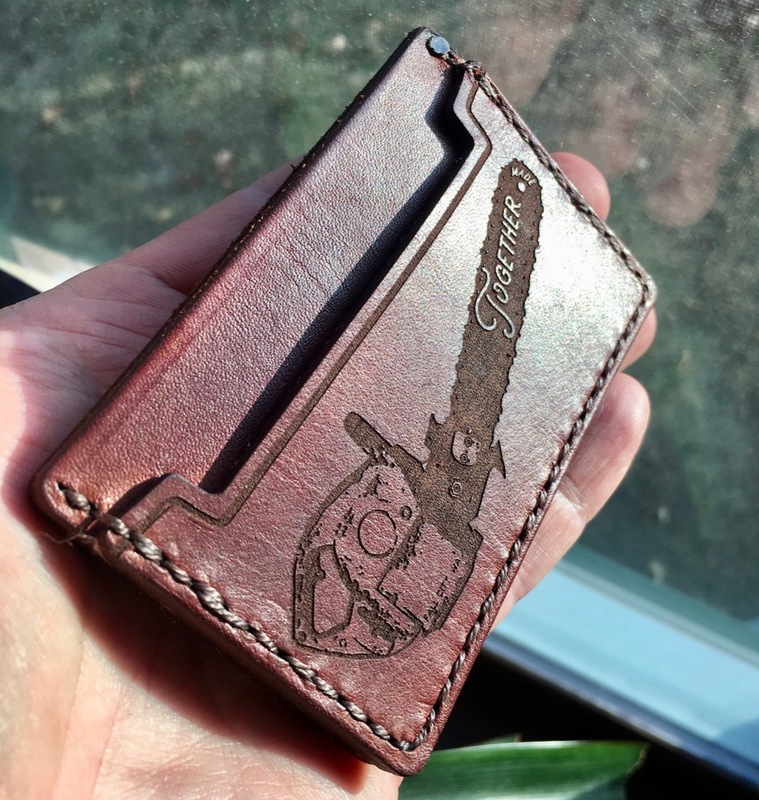 It makes for a simple three-pocket card wallet, but again, it’s a fun little project to make, and know you made something you carry.